Going to check out this any buying advice welcome. Cover that gopping grill up!! Buy the car next to it. Thanks for all the help here guys? what a cracking R8 Forum !! If you're going to call someone an idiot, make sure you can spell, you illiterate dolt. Also, when you're ready, tell us all why we're so jealous? Matt's got a cob on because we dissed his plate? As for the R8, it's an R8. I too would look at the Mac. 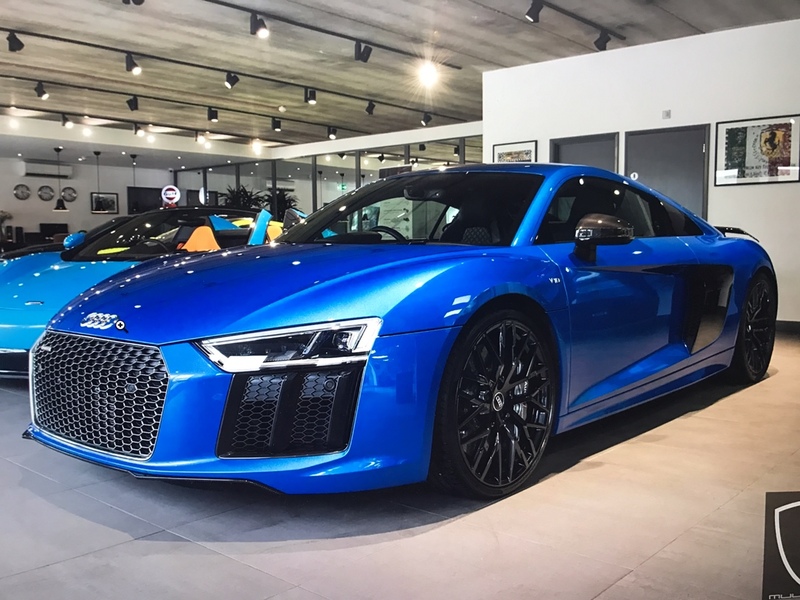 Just don't expect supercar service on your R8 from your local Audi stealership. Oh dear, did he have one of those chavvy plates that no one understands, unless you read it with eyes squinted and say it with a lisp? Oh this is going to be special. Correct.....if it's the one I recall, the letters were squeezed right up such that they were almost joined up. Have had mine a few months now and love it.... can really fault it, it looks a good spec so it just depends what you want from the car, myself and the wife are using it most days so I think it's the write choice this time round...I got my vegas yellow Jan 16 car with 3k miles from Audi for £105k after some pushing. The grille does annoy me too but I ordered the Audi Sport one yesterday so it will look better @ bam.... Did you view it? I need something with four seats. Mat. Seriously you wrote that. Well what I'll say is if you're on here everyday then you're also one of the "jealous idiots" that frequent here. Call us idiots all you like, but trust me, jealous we most certainly are not. I mean really, of your number plate!! What you'll also find when/if you stay around on this forum is the people with all the good opinions are the same as the ones with all the bad opinions. All opinions are never going to be "good" and when they are "bad" you have to be grown up enough to take the "bad"on the chin. Now saying that what was you expecting when you flashed up your " new plate thread" ? Did you want us all to jump up and down and say " oh man that looks smart". Well we didn't because it looks rubbish. So does that make me a jealous idiot because I've made an opinion. The thing is Paddski was making a light hearted comment about the because a lot of the so called idiots have made plenty of comments on his other cars and been here long enough to take a joke. Whereby you haven't and jump in to make your silly " you're all jealous idiots" remark. A bit of advise. Don't take things so seriously and don't ask and post things if you don't want negative opinions.